Get Baby’s in Black at Amazon. The Beatles have inspired so much over their history. Countless musicians and artist cite them as the spark that ignited their own creative passions, and if there’s one that often comes from their existence it’s the endless “What If’s.” All through the last quarter of 2010 as we acknowledged the 70th anniversary of John Lennon’s birth and the 30th anniversary of his death, we asked “What if?” What if he had lived…how much more music would he have created, would he be on Twitter constantly, and how would he have responded to 9/11? We can only speculate now and wish to see it for ourselves. For me, a constant “What If” in the Beatles history prompts me to think about what might have gone down differently had Stuart Sutcliffe lived. If you’re a die-hard fan who has followed The Beatles from The Quarrymen days to Let it Be, you know Stu was the true “fifth Beatle.” He was John’s best friend and a talented artist. In his very short life he made an indelible mark in the world of popular music – he helped name the band, and despite having very little musical talent he was deemed good enough by Lennon to join in the early glory, because no way did Lennon want a band that didn’t include his closest friend. Some have speculated (or perhaps wished) that the Lennon-Sutcliffe relationship stretched past platonic into something more intimate – though no proof really exists of that. Philip Norman’s John Lennon: The Life goes so far as to boldly suggest that Lennon had caused the aneurysm that claimed Sutcliffe’s life – perhaps one of the few surprises that biography offered, one that is also quite difficult to prove. What do we know about Sutcliffe? We know he accompanied John, Paul, George, and Pete (remember, this is the pre-Starr era) to Hamburg to pay the requisite starving musician dues in the Reeperbahn, which apparently in the late 50s, early 60s made Las Vegas look like Sesame Street. He met a local girl named Astrid – a kindred soul and eventual confidante – and chose to follow his heart. Sadly, his head didn’t prove as healthy or as willing to stay, and he lives on mainly through stories that keep the band’s early spirit alive. It is only fitting, too, that the story of Stu and Astrid’s brief yet iconic relationship be portrayed in a graphic novel. 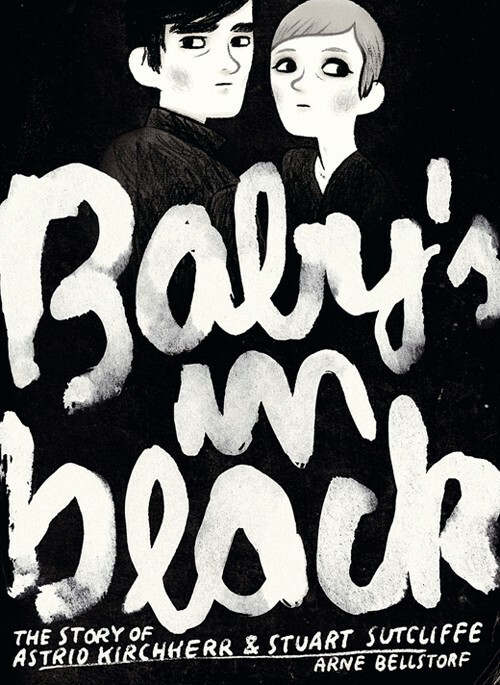 Baby’s in Black was conceived and drawn by artist Arne Bellstorf. The title comes from the Lennon/McCartney song, a somber ballad that Astrid’s loss inspired. Black opens with an ominous dream of Astrid wandering alone in the woods, transfixed by something that doesn’t belong there but ultimately does. She’s awakened by friend (and former companion) Klaus Voormann, who has just come from a club in the Reeperbahn having experienced a phenomenon unlike anything he’s seen: rock and roll, and more specifically the five-piece British band playing it. It’s clearly life-changing enough to justify waking Astrid in the middle of the night to convince her to see the act. The moment she agrees sets in motion Astrid’s own life-changing moment when she joins Klaus the next night and notices the quiet bassist hiding behind sunglasses as he tries to hide his musical inadequacies. Black near-faithfully progresses with the courtship of Astrid and Stu, which flourishes despite a tenuous language barrier and the ever-present specter of Klaus, who seems to find consolation in actively supporting The Beatles’ young career (Voormann would remain associated with the band for years in various roles). The black and white artwork nicely sets the atmosphere of postwar Germany – even in the merriest of places like Hamburg’s red-light district there is an underlying seediness that simply cannot be expressed in color. The young Beatles are reproduced to recognition: Paul’s expressive eyes, George’s pensive brow, and John’s wizened expression. Pete Best, another “fifth” in the band’s lore, barely figures into the story. If there are any complaints about Black, they may stem from the comparisons I keep wanting to make to the film Backbeat, which is the only other source I’m familiar with that focuses on this part of Beatles history. Where the film brought out tensions rising from Stu’s defection, and perhaps a hint of resentment aimed at Astrid for “stealing” Stu, you don’t get that in Black. Through much of the book, expressions do not furrow or pinch in anger – everything just seems to happen. Perhaps this was a quality of the existentialist attitude that influenced Astrid and Klaus’s circle of friends back in the day, but having read other accounts of the band’s Hamburg days (particularly Lennon’s zealous attempts to incite the crowd with Nazi references) I have noticed much of that is downplayed in this book. Of course, this story belongs to Stuart and Astrid, so there is really no need for Lennon’s antics to disrupt the flow. Baby’s in Black remarkably realizes this brief passage in modern music history. Simple dialogue and bold imagery speak out in a way no song can.